2. Hot or Cold Water? Pressure washing or power washing are used interchangeably for this machine. The best pressure washers are better than sliced bread for me! For removing dirt, stains, mold, mildew, chewing gum, and more, they cannot be beat. 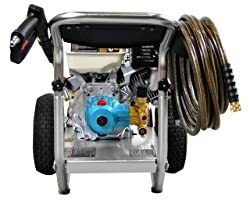 Read my gas pressure washer reviews below for understanding types available and for the best clean machine in the marketplace. Pressure washing units are well-designed for deck maintenance, gutter cleaning, repairs and installation, stucco, roof cleaning, pavers, cabinetry, vehicles, tires, and much more. 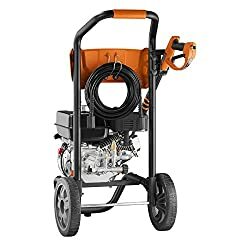 Read below for my electric pressure washer reviews. I don’t know of anything that cleans better than a pressure washer for decks. They clean everything: driveways, patio furniture, shutters, bird droppings, screens, roofs, cars, trucks, SUVs, RVs, siding, gutters, and more. 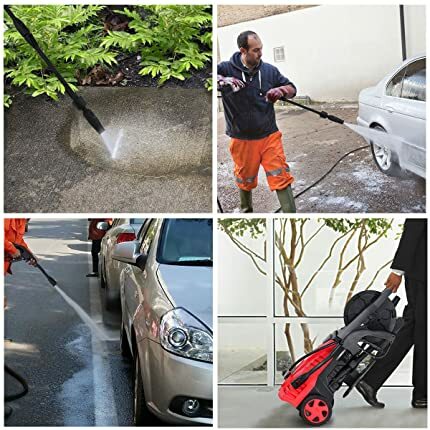 We all know that pressure washers are the best way to clean effectively and in a shorter amount of time. Manual cleaning is a pain, wastes time, and wears you and the broom out. The highly pressurized stream of water blasts away grime, dirt, mold, mildew, stains, and other stuff you don’t want stuck to your home, concrete, wood fences, vehicles, tires, rims and much more. 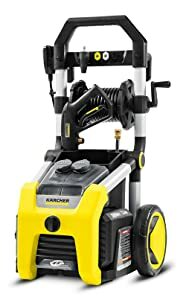 The best brands for power washer reviews are listed below for your consideration when buying showing the quality features and power. Pressure cleaning can remove years of dirt and grime build-up along with the green mold and mildew you will find on the north side of the house, wood furniture, concrete, brick, and more places in a humid or rainy climate. 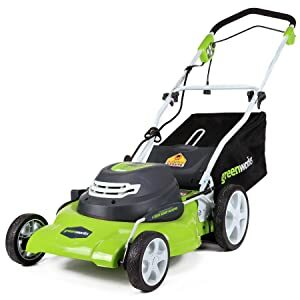 Electric pressure washers are great for small areas with an electrical outlet such as a small wooden deck or a few steps and sidewalk plus the car. These are more quiet and lighter in weight. You are not as mobile dragging along a cord. And always be safe with no wet hands or feet. If you use the unit in a commercial business, gasoline-powered pressure washers are best. If you have a pool with a deck, patio, walkways, and fence, the gas-powered unit is the way to go. You will be more mobile without having to trip over a cord and have more power. Hot water is best if you can afford it. Cold water works, but if you are cleaning anything greasy, such as the garage floor where oil or transmission fluid has leaked, you will have better results with hot water. This means pounds per square inch of pressure. The higher the PSI, the harder the water shoots out. It’s like having the kitchen water faucet low or full force. If the PSI is from 3000 to 4000, you will have plenty of pressure for doing most jobs. Anything below 2000-2800 PSI is light-duty and is best for outdoor furniture and the family vehicle. Heavy-duty power washers over 3300 PSI are more expensive and used mostly in commercial applications. GPM is an important number for your consideration. The washer will pump out so many gallons per minute of water. The more water the more surface area you can clean in that one minute. The flow generally runs from 1.0 and 4.0 GPM. The higher the number, the greater its cleaning ability being faster. A higher force will be able to remove stubborn mud, mildew, and handle other tough cleaning projects. Pressure washers today will at least have a downstream or after-the-pump injection system for soap and/or chemicals. It’s not an exotic system at all; it’s simply a function of the tips for creating suction with very little pressure. Offered as well are the before-the-pump injection system found mainly on high-end more expensive models. With this method, soap/chemicals/water go through the pump then being sprayed at a high pressure. A feature of downstream injectors that’s different from upstream injectors is that the pump doesn’t work as hard to pull the water in for pressurizing it. Downstream injectors for dispensing detergent, water, and/or chemicals have less stress than the upstream type of injector. Therefore, you have less wear for the pump to last longer than with the upstream type. A downstream injector works through the principles of hydrodynamics called the Venturi effect. As pressurized water passes by the constricted orifice of the chemical injector, the high velocity of the pressurized water that passes creates a vacuum and thus draws the solution to mix along with the pressurized water. 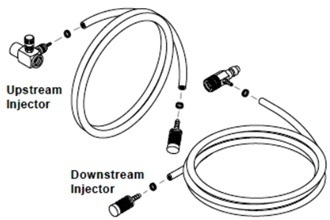 However, in order for the injector to work properly, the use of a low pressure nozzle is recommended. The Sun Joe® model SPX3000 is a top best seller on Amazon.com® for light, medium, and heavy cleaning chores. Being a cheap pressure washer, it does the job as well as a pricier unit. 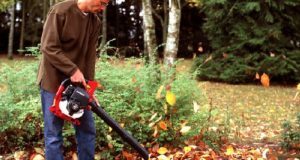 Clean up things around your homes, buildings, RVs, cars, trucks, boats, decks, driveways, patios, lawn equipment, patio furniture, brick, pavers, concrete, and more. It has 5 quick-connect spray tips of 0-, 15-, 25-, 40-degree and soap for attacking your cleaning jobs be it light, medium, or heavy. The TSS (Total Stop System) will automatically shut off the pump when the trigger is not engaged to save energy and prolong pump life. An added convenience are the 2 detergent tanks of 0.9 liter onboard that are removable to carry and store different types of detergent to simultaneously tackle different cleaning projects. The power washer is CSA approved. The CSA Group (formerly the Canadian Standards Association) is a standards organization that develops standards in 57 areas. CSA Group publishes standards in print and electronic form and provides training and advisory services. CSA Group is composed of representatives from industry, government, and consumer groups. It’s a good thing for consumers. Plug the 35-foot 3-prong grounded UL® listed cord into a 110/120-Volt, 50/60 Hz receptacle. It does not work on 220/240-Volts outside North America so buy an adapter. It weighs 31-pounds. The pressure hose is 20-feet long plus you’ll get a garden hose adapter. The electric motor is 14.5-Amps at 1800-Watts generating up to 2030 PSI and 1.76 GPM for maximum cleaning power and water inlet temperature max is 104-degrees Fahrenheit. You will receive a User’s Manual and a 2-year Warranty. 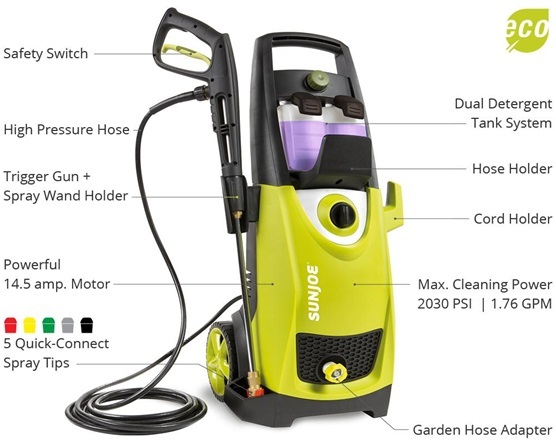 Accessories included are two 30.4-ounces (0.9 liter) removable detergent tanks, 34-inch extension wand, 20-foot high pressure hose, 35-foot power cord with GFCI (Ground Fault Circuit Interrupter) protection, garden hose adapter, needle clean-out tool and 5 quick connect spray tips. It is made in China. The PowRyte manufacturer is a registered trademark of Powell Works®, Inc. located in Hangzhou, China, a leading supplier for over 15-years. The model 5001750 is a best-selling power washer on Amazon.com® with high rankings. 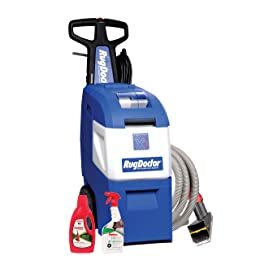 It has an adjustable spray nozzle, extra turbo nozzle, 1 onboard detergent tank and a different model has a hose reel for storing the hose on top. That model is currently unavailable at the time I am writing this review. With the spray nozzle from 0- to 40-degrees, you can fan the spray to get to the grime, moss, mold, dirt, and more to include the 0-degree pencil jet that rotates 360-degrees for the maximum dirt cleaning function. This will give you 50% more cleaning action quickly. Of course it has the GFCI plug and TSS (Total Stop System) trigger that automatically shuts off the pump when the trigger is not engaged for safety. The ETL® (Electrical Testing Labs®) listed mark, created by Thomas Edison in 1896, is recognized by local inspectors and Authorities Having Jurisdiction (AHJs) throughout North America and also in some areas of South America. The ETL® listed mark is an accepted alternative to UL® (Underwriters Laboratories®) and, as such, inspectors and AHJs recognize, acknowledge, and accept the mark as proof of product compliance. This pressure washer is ETL® approved. Plug the 35-foot 3-prong grounded UL® listed cord into a 110/120-Volt, 50/60 Hz receptacle. It does not work on 220/240-Volts outside North America so buy an adapter. It weighs 21.7-pounds. The pressure hose is 20-feet long plus you’ll get a garden hose adapter. The universal wobble plate pump electric motor is 13-Amps at 1800-Watts generating up to 2030 PSI and 1.8 GPM for maximum cleaning power and water inlet temperature max is 104-degrees Fahrenheit. You will receive a User’s Manual and a 2-year Limited Warranty. 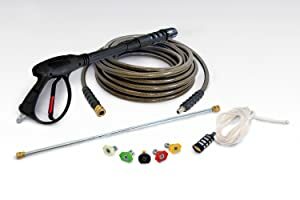 Accessories included are 1 removable detergent tank, 34-inch extension wand, 20-foot high pressure hose, 35-foot power cord with GFCI (Ground Fault Circuit Interrupter) protection, and a garden hose quick connector adapter. It is made in China. 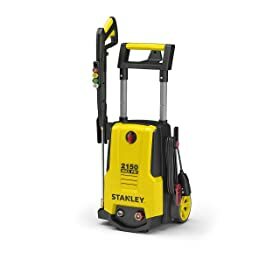 The STANLEY® model SHP2150 shown on Amazon.com® in yellow is the most powerful electric pressure washer STANLEY® makes. 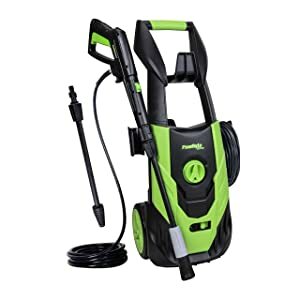 The cleaning power comes from a proven universal motor and triaxial pressure washer pump delivering 2150 PSI of adjustable cleaning power that you can use to quickly blast away dirt, mold, moss, mildew, and grime to reveal a fresh clean look. It also comes with a specially designed detergent bottle that doubles as a high-pressure foamer for removing deep stains found on aluminum or acrylic siding, concrete, pavers, pools, patio furniture cars, trucks, RVs, ATVs, garbage cans, animal cages, and more. 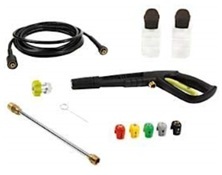 The most common accessories included are the pressure washer gun, pressure washer wand, 25-foot high pressure hose, foam cannon/detergent tank, 4 quick connect nozzles and O-ring replacement kit with professional-grade brass garden hose connector and M22 connections. The dimensions are 26.77-tall x 13.58-wide x 13.57-inches deep. It weighs 26-pounds. The pressure hose is 25-feet long x 1/4-inch diameter, plus you’ll get a garden hose adapter. And it moves on wheels. Plug the 35-foot 3-prong grounded UL® listed cord into a 110/120-Volt, 50/60 Hz receptacle. It does not work on 220/240-Volts outside North America so buy an adapter. The universal motor and triaxial pressure washer pump motor is 13-Amps at 2000-Watts generating up to 2150 PSI at 1.8 GPM for maximum cleaning power. It does not use hot water. It has 43 times the pressure of a 7 GPM garden hose. You will receive a User’s Manual and a 2-year Limited Warranty. 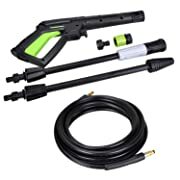 Accessories included are one removable detergent tank, spray gun holster, nozzle cleaning wire, soft PVC (polyvinyl chloride) pressure hose, nozzle tray, zinc steel lance, quick connect nozzles, spray gun, spray gun trigger lock, O-ring replacement kit, garden hose adapter and a screw. It is made in China. The Kärcher K2000 electric power pressure washer 2000 PSI TruPressure™ includes the turbo nozzle. 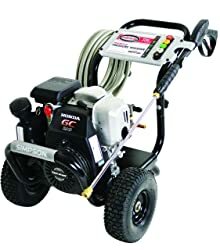 The unit available on Amazon.com® has a built-in pressurized hose reel and a very handy on/off foot switch on the front and is one of the best home pressure washers offered. Kärcher is excellent for gentle or tough cleaning jobs. Pressure washing makes the old and dull new again. The wheels are 10-inch diameter and the handle folds for storage and rotates as well. Four quick connect nozzles are include with turbo power at 50- and 40-degrees using detergent if you like. You cannot use hot water in this unit. This machine has a large storage bin that is removable and has 2 removable 1/2-gallon detergent tanks with a selector switch to easily alternate between detergents plus a water filter. The hose connections are M22 and the adapter garden hose is A3/4-inch. At the top of the handle are 2 hooks for cord storage. The GFCI plugs into the side of the handle. The hooks for the cord rotate to release the cord similar to a vacuum cleaner’s cord storage. The dimensions are 18.25-inches long x 22-inches wide x 35.5-inches tall. It weighs 33.5-pounds without accessories. The pressure hose is 25-feet long x 1/4-inch diameter, plus you’ll get a garden hose adapter. 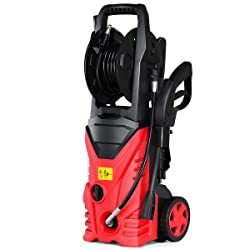 The max water inlet temperature is 104-degrees F.
The induction motor pressure washer pump motor is 13-Amps at 2000-Watts generating up to 2000 PSI and 1.3 GPM for maximum cleaning power. You will receive a User’s Manual, accessories, and a 3-year Warranty. It is made in China. 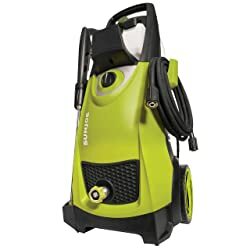 The Goplus brand pressure washer is one of the best electric pressure washers shown on Amazon.com® and is inexpensive for the power it has. Many other power washers require you buy attachments, yet this unit includes all in one package. It is available in fun colors of red or blue including a washing brush. The 2030 PSI has a minimum flow rate of 1.6 GPM with a 7.0 max rate/1-minute to give you all the power you’ll need for all your cleaning needs. The power is 1800-Watts for a steady powerful water flow. For even more power, you get the turbo wand. The unit shuts off automatically when you release the handle and the hose reel comes with it. It uses a washing machine size hose not a garden hose size. All pieces will attach quickly and easily with the quick connect M22 connectors. The large wheels let you effortlessly push or pull it where you need it to be. It’s ergonomic and compact for storage and ease of use. The unit is 98 dB sound level. Clean your tires, engine, concrete, wood fences and decks, furniture, pavers, brick, siding, boats, and more. With the simple operation system, you can just turn the switch on and begin your cleaning easily. 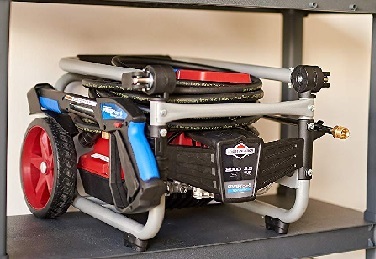 The onboard reel keeps the high pressure hose organized for quick and easy storage. The maximum inlet water pressure is 1.4 MPA with its degree of protection of IPX5 and rated temperature of 0- to 104-degrees F. (40° C.). The dimensions are 13.3-inches wide x 14.4-inches deep x 35.1-inches tall and weighs 16-pounds. 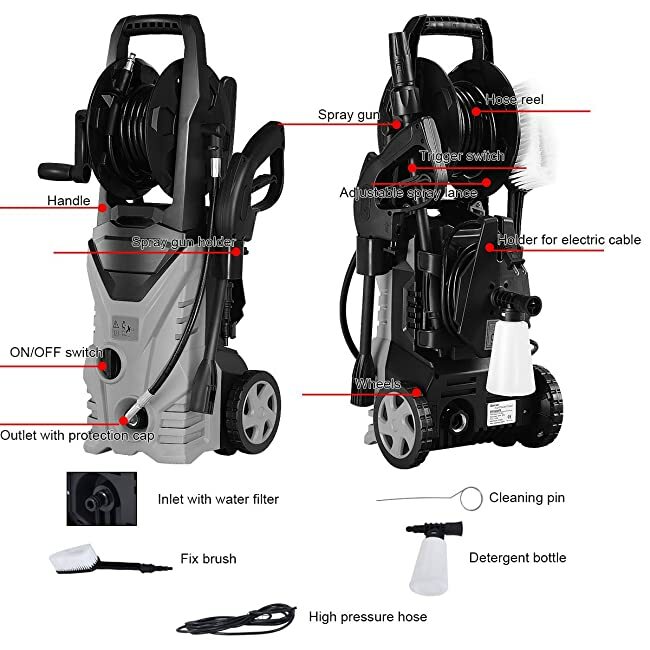 You will receive a User’s Manual, the pressure washer, 2 water hoses, a deck scrubber, a scrubbing brush, metal joint, cleaning pin, detergent bottle, and the turbo wand. It is made in China. 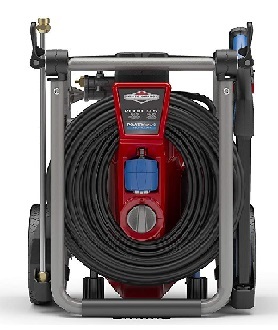 The Simpson® aluminum 4.0 GPM at 4200 PSI is a super portable pressure washer for industrial and home applications. The model ALH4240 shown on Amazon.com® is affordable and hefty. The HONDA® GX390 OVH Engine is reliable and one of the best on the market with low oil shutdown warning. Its frame is aircraft grade aluminum with brushed extruded aluminum tubing for durability and stability. With the cast iron cylinder, life of the unit is increased. The industrial triplex plunger pump is made by CAT PUMPS® and the spray gun is comfortable to use. You will have 5 quick-connect nozzle tips for your specific functions at 0-, 15-, 25-, 40-degrees and soap on the Dial-N-Wash adjustable spray gun. The steel braided hose is huge at 50-feet long x 3/8-inch diameter and will never kink resistant to abrasions. With its 13-inch premium pneumatic tires, you can travel over anything. Be sure to change the engine oil every 200- to 250-hours for good running plus engine life. 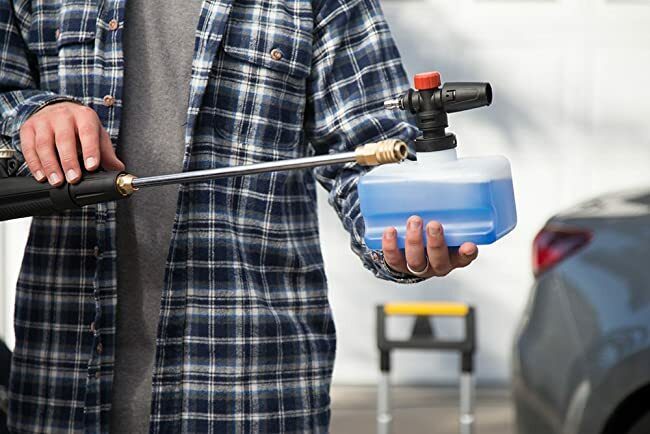 With the wand made of 31-inch steel with quick connect and threaded M22 connections, you’ll have no problems getting to all the areas you want cleaned. Use only cold water as stated in the instruction book. This model is available in 3200 PSI @ 2.8 GPM; 3400 PSI @ 2.5 GPM; and 3800 PSI @ 3.5 GPM. The measurements are 38-inches long x 24-inches wide x 26-inches tall weighing 128-pounds. The CU for this 4200 PSI model is 16800. You will receive superb Warranties: 3-year Limited HONDA® GX Commercial Engine Warranty; 2-year Limited Pump Warranty; 10-year Limited Frame Warranty; and a 90-day Limited Accessory Warranty. The washer is made in China. The BRIGGS & STRATTON® company makes the finest engines and motors for their equipment for home users. The POWERflow+ Technology™ gives you the power to do more. 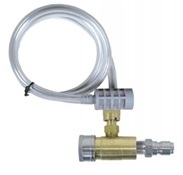 The model number 20667 on Amazon.com® is affordable for the 2000 PSI at 3.5 GPM unit. You will have 7-in-1 spray nozzles, a 25-foot hose and a detergent tank with the cleaning solution injection system and thermal relief valve. The 2000 maximum PSI is 1.1 GPM and 3.5 at 80 PSI for the flow you need for your specific application. This washer is among the best car pressure washers, and is a champion for cleaning gutters, siding, concrete, wood fences and patio furniture, pavers, and more. The frame is welded steel for strength and durability and not plastic. The pump is the plunger type. Now you have the power to command the right mix of high-pressure and high-flow to master any job with the patented pump. Switch between jobs with just a few clicks and open the door to new cleaning potential with the 7-in-1 nozzle. Have peace of mind with a reliable motor that runs quietly year after year. Eliminate fatigue and sore hands during long jobs with a grip that’s custom-designed for comfort. Reach higher with your cleaning potential with 20-feet of flexible hose that’s built to endure hard work and high pressure. The dimensions are 13-inches long x 47.5-inches tall x 37.5-inches wide and it weighs 47.5-pounds. The extension wand is about 36-inches. Plug the 25-foot 3-prong grounded UL® listed cord into a 110/120-Volt, 50/60 Hz receptacle. It does not work on 220/240-Volts outside North America so buy an adapter. You will receive instructions with the User’s Manual and a 1-year Limited Warranty. It is made in China and no longer in Germany. 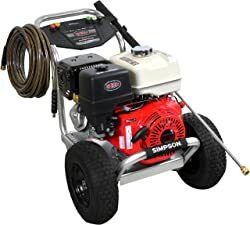 The SIMPSON® MegaShot is a high-end pressure washer to clean anything from oil build-up in garages to patios and more. The model MSH3125-S is gasoline-powered shown on Amazon.com® and is well-worth the cost. 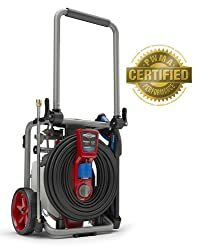 At 3200 PSI at 2.5 GPM, this easy to use power washer will eliminate dirt, grime or even mildew from any hard to remove spots or areas at home or business. Clean surfaces and floors in no time using the powerful HONDA® pressure washer with 4-cycle engine to eliminate the mess on any cleaning surface. Perfect for all floors either wooden, tiled or marble, windows, garden fences, decks, furniture, patio, prepping home exteriors for painting, rooftops and so many other uses for you to discover. It has a maintenance-free OEM (Original Equipment Manufacturer) Technologies™ axial cam pump with a HONDA® GC190 engine (GC is vertical shaft, not horizontal). HONDA® is one of the most recognized and valued brands in the USA. It is rated in the top 20 brands – higher than any other engine manufacturer. When a customer or friend sees HONDA® on your power washer, they immediately recognize the quality, reliability, and value. The MorFlex™ hose is 1/4-inch x 25-feet and is non-marring, kink, and abrasion resistant and is equipped with the threaded M22 connections. Select from 5 quick-connect nozzle tips of 0-, 15-, 25-, and 40-degrees and soap. With the ergonomic spray gun with safety lockout designed for comfort and control you will not feel stressed using this pressure washer. The frame is welded steel and is heavy duty with 10-inch premium pneumatic tires. The wand is 16-inches made of steel. It has a choke and a pull-rope start; not electric. Use only cold water, not hot, and you can use bleach. The dimensions are 34-inches long x 21-inches wide x 24-inches tall weighing 59-pounds. The handle does not fold. WARRANTY DETAILS: ENGINE – 2-year Limited Consumer Warranty; PUMP – 1-year Limited Warranty; FRAME – 5-year Limited Warranty. NOTE: all of the SIMPSON® pressure washers are 100% functionally tested in the factory and may contain minimum residual fuel or fuel odor. While the oil and gas are removed from the pressure washer engine after the testing is completed, it is normal for a small amount of residual oil to be left in the engine. 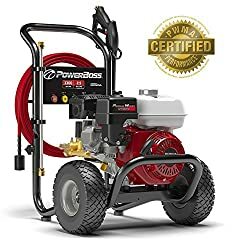 The PowerBoss® Pressure WasherGX200, item model number 20726 on Amazon.com®, is affordable for 3300 PSI at 2.5/2.7 GPM. It’s also available in 2800 PSI at 2.3 GPM, 3100 at 2.8 GPM, and 3300 at 2.7 GPM. 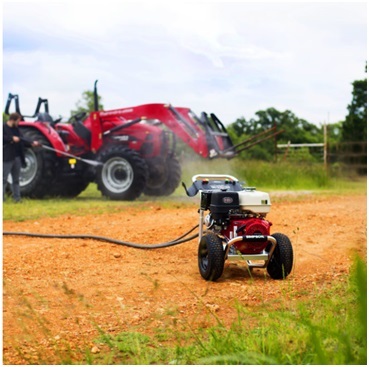 The unit is powered by a HONDA® GX200 196 cc OHV (overhead valve) engine that has been designed and engineered specifically for pressure washer applications. 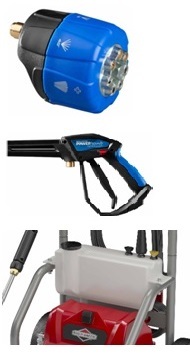 Being one of the best gas pressure washers, you will appreciate its many quality features. With the washer comes a 30-foot EASYFlex™ high-pressure hose, 5 nozzles and detergent injection system. The steel frame is welded with an ergo handle sitting on 10-inch pneumatic wheels to easily maneuver on different height ground. What’s nice about this unit is that the pump can be tuned for your needs from 300 to 3300 PSI and all numbers in between. The 5 quick-connect tips are 0-, 15-, 25-, and 40-degrees plus soap with predefined spray patterns to easily switch between a variety of cleaning jobs. Upgrade your power washing in seconds by simply siphoning cleaning solution into the water stream. It will start easily usually with one pull on the rope; it is not electric starter operated. The dimensions are 22.5-wide x 24-inches tall x 20.5-inches deep and it weighs 62-pounds. You will receive a 24-month Limited Consumer Warranty and a 3-month Limited Commercial Warranty. It is made in China although HONDA® is of Japan. 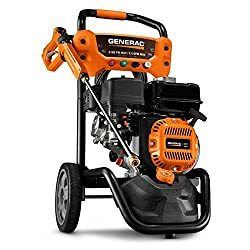 The GENERAC® 3100 PSI 2.4 GPM model 7019 available on Amazon.com® is affordable and functional for all of your cleaning needs made of steel for the frame. The PowerDial™ spray gun with power dial lets you adjust the pressure for your vehicles, wood, concrete, and siding. Cleaning is achieved easily with the GENERAC® 196 cc OHV engine with a horizontal axial cam pump. A large 1/2-gallon detergent tank is located on the machine for convenience. The quick change nozzles are 0-, 25-, 40-degrees and soap and M22 threaded to hose and lance connections. 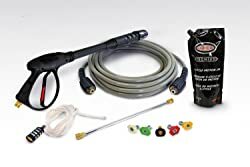 The 5-foot high pressure hose connects to the rear of the spray gun for maximum convenience. Use a water temperature max of 100-degrees F. and no hotter. This unit uses a manual choke with fixed speed throttle and a rope to start quickly the first time. For rough terrain, the wheels are large at 10-inches with a fixed click-in handle. The washer does not fold. The dimensions are 24.4-inches long x 18.9-inches wide x 35.5-inches tall and weighs 57-pounds. The hose length is 25-feet x 0.25-inches diameter. You will receive the User’s Manual and a 2-year Limited Warranty. It is made in the USA using domestic and foreign parts. Do not let your pressure washer stay out in the rain or snow. It is not recommended to use extension cords with power washers. Check your User’s Manual to see what it has to say and always buy the correct AWG (American Wire Gauge) cord and length. The recommended engine oil for pressure washers is SAE 30 or 10W30. Do not lay non-folding machines on their back; oil will leak out. Keep upright. Put tarps around your house to protect grass, plants, and small trees to collect debris whooshed off. Hold the wand at a 45-degree angle to prevent dirt from being driven into the surface when using it straight on. This prevents indentations, dimples, depressions, and cavities on metal, wood, or vinyl/acrylic siding. No one wants hollows, holes, or craters in anything. For cleaning siding, start at the bottom working your way to the top using even overlapping strokes a small area at a time. Rinse the siding from the top to the bottom. Do the same for wood decks. Keep the stream of spray level to prevent water from getting behind the siding that can cause mold. Be cautious if you use a lance extension since it has a kickback that can send it into power lines. Do not spray windows with a power washer; the pressure will break the glass. Check your manual for if windows are safe for that model. I know you will be excited using your first pressure washer. I was! They are indeed a miraculous way to clean almost anything! Leave a note, question, or idea and let us have your thoughts in the comment box below.